A literate mappa mundi to bookstores. This is the first of Spanish author Carrión’s books to be translated into English. He writes that “every bookshop is a condensed version of the world,” this book like a “cartography of a bookshop.” Entering this Borges-ian labyrinth of books, readers will encounter bookshops as “archaeological sites or junk shops,” police censorship, the lives and works of booksellers, reading as “obsession and madness,” and the “bookshop as the world.” This is no mere travel guide but rather a philosophical, reflective, wide-ranging inquiry into the world of books. Carrión began the first of his many voyages in 1998 at a bookshop in Guatemala City. He reminds us that the “oldest bookshop in the world” is in Lisbon, not far from his home in Barcelona. Along this journey, readers are guided by Montaigne and Diderot epigraphs as well as wisdom from a vast array of writers, including Goethe, Mallarmé, and Benjamin. The bookseller is a “critic and cultural activist,” and since ancient Rome, bookshops have been “spaces for establishing contact.” Carrión is excellent discussing Paris’ most famous shops, American Sylvia Beach’s Shakespeare & Company, where Joyce’s Ulysses was born, and Adrienne Monnier’s La Maison des Amis des Livres. Both also functioned as lending libraries, art galleries, hotels, and cultural centers. 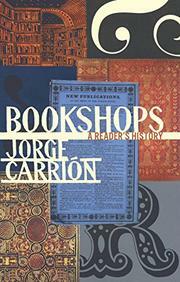 Carrión sees bookshops as political bastions and recounts The Satanic Verses uproar, Hitler as bestselling author, Mao Zedong’s bookshop/publishing house, and book burnings. His trip across America includes visits to New York City’s Gotham Book Mart and the Strand, Denver’s Tattered Cover, Portland’s Powells, and San Francisco’s City Lights. The author also discusses the impact of the brick-and-mortar chains and Amazon, the “supreme Virtual Bookshop,” as well as the sad story of a 100-year-old Barcelona bookshop that became a McDonald’s. An insightful, educational, and erudite paean to bookshops.